In Jordan, there is a perfectly developed mobile market. About 7 million 347 658 people of 7 million 734 377 use mobile phones, i.e. 95% of the population! Terminators wishing to install, for example, the gateway GOIP 8 in the country need to take into account that the country has an excellent GSM coverage. There is hardly a town, where the subscriber is out of network coverage. 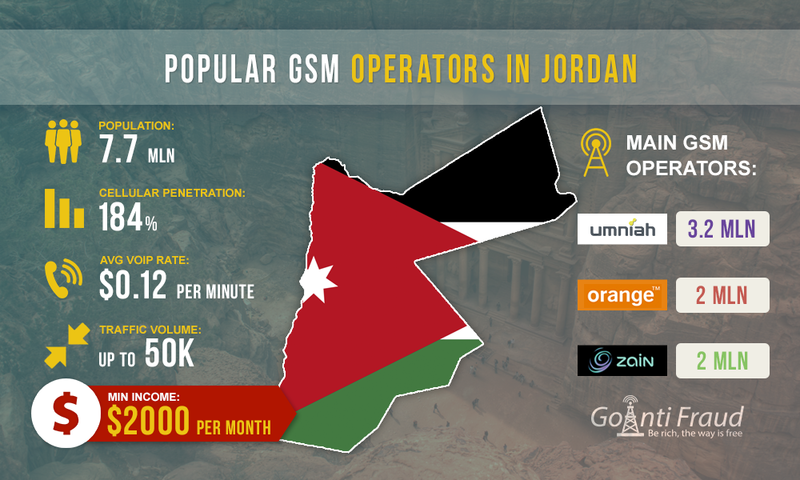 Major GSM-operators in Jordan are Umniah, Zain (aka Fastlink), and Orange. Umniah has the largest number of users in the country as its subscriber base consists of 3.2 million customers. Zain (aka Fastlink) and Orange have approximately 2 million subscribers. According to the latest data, Zain has 2 million 347 459 subscribers, and Orange about 2 million users. For these reasons, many of those who wish to capitalize on VoIP-minutes believe that Gsm termination will be efficient in Jordan. They, in turn, are interested in the most favorable packages of the above operators, allowing to make as much as possible money, that is, with a minimum pay-per-minute to make local calls. Unlimited tariff plans that provide a long-term presence in the network enjoy the success. You can enjoy the most favorable conditions for termination, if you connect the Zero tariff plan from Umniah. The package is aimed at tourists who come temporarily on vacation for 7 days. To connect to Zero, you need to replenish the balance in the amount of $1.41, and then you can receive calls from and make calls to any number. The package is ideal for termination as it is the cheapest and most loyal in terms of blocking SIM-cards by antifraud systems. Second place in terms of a lucrative termination is occupied by the Ghair shekl line package from Orange, in which the operator provides on-net 3,000 minutes, including 300 SMS for as little as $8.47. When you connect the package, a minute of termination would cost as little as $0.0029. It also provides numerous calls. In contrast to the conditions offered by Umniah and Orange, Zain tariff plans are not that favorable. The minute termination via Zain will cost from $0.0095 to $0.024, depending on the selected package. By the way, this operator packages can be purchased at $8.47 to $21.17. The price varies in different regions. By the way, the average price of a voip minute towards Jordan is $0.12. When connected to one of the above packages, profit per minute of termination ranges from $ .1253 to $0.1174. Accordingly, on average, you can make from $1,900 to $2,100 a month via one equipment port, given the operator antifraud. And when you install a multi-channel device, this amount can be increased substantially.